Delaware & Lehigh National Heritage Corridor - Times Publishing Newspapers, Inc. The result is the Delaware & Lehigh National Heritage Corridor, a nonprofit organization that preserves the historic pathway that carried anthracite coal and iron through Bucks County from Wilkes-Barre to Bristol. Today, the nonprofit and its 165 miles of trail are a vital connection to nature, health and wellness, our nation’s industrial heritage, and more than $474.7 million in annual economic impact. Join the D&L as a member, and enjoy benefits such as discounts on canal boat dinner cruises on the Josiah White II, Pennsylvania’s only mule-drawn canal boat attraction. 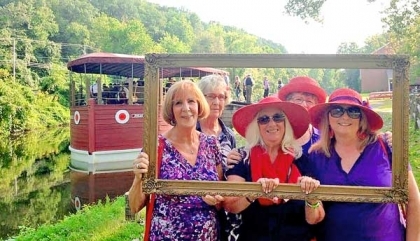 While you dine in style, an authentically dressed crew navigates the 50-foot, two-level passenger boat on a two and a half hour tour of the Lehigh Canal, including an experience of traversing a canal lock and live entertainment. By becoming a member, you also help to build, maintain, and connect the D&L Trail. In 2018, we made major connections in the Delaware Canal region. Two of the three remaining gaps in the trail along the Delaware Canal section are well on their way, including the Bridge Street Crossing in Morrisville, the development of Tyburn Road section, and the Conrail underpass, about a mile south of the Bridge Street Crossing. As you see, the D&L Trail bridges people with natural beauty and waterways. Programs like D&L Trail Towns have increased visitation to New Hope, Yardley, and other towns in the region. In addition, the Delaware & Lehigh National Heritage Corridor website provides an interactive trail map that links users to heritage sites and attractions, places for wildlife viewing, and live music and theater. Plan your next trail journey at: Delawareandlehigh.org. Please consider becoming a D&L member today and help us preserve the culture of our corridor: http://delawareandlehigh.org/giving/become-a-member/. The National Heritage Corridor’s partnerships with Delaware Canal State Park, Delaware Canal 21 and the Friends of the Delaware Canal help tell the Delaware Canal story as well as find solutions to maintain and sustain the Canal. PHOTO CAP: Don’t miss the Delaware & Lehigh National Heritage Corridor’s canal boat dinner cruises on the Josiah White II, Pennsylvania’s only mule-drawn canal boat attraction.